Not In Christ = Condemned ...Already. You might not like it, but that's Scripture. Only in Christ is found salvation. Outside of Christ, the world is lost. If we look at 1 Cor. 15:22, which states that ALL who are in Christ will be made alive, we have to ask the questions: Are all men in Christ? If not, how do we get in Christ? What happens to those who remain in Adam? II Cor. 5:17, tells us the BIG 'IF' of being in Christ. It says, "IF any man be in Christ, he is a new creature." Why the 'IF"? Because NOT ALL men are in Christ. It does NOT say, "Since all men are in Christ, they are all new creatures." No, it says, "IF" showing that it is conditional and not certain. If it is conditional, then what is the condition? Gal 3:26 was written to believers at Galatia. Paul writes, "For ye are all the children of God by faith in Christ Jesus." How are they "children of God"? By mere existence or by faith? By faith in Christ. That is, a person MUST believe in Christ to be counted a child of God. "Without faith, it is impossible to please him." Those who are not 'children of God by faith' are plainly labeled by Christ himself as 'of their father the devil' (Jn 8:44). This faith in Christ reaches out to Him. It calls upon Him. "For whosoever shall call upon the name of the Lord shall be saved." What about those who don't call, who don't believe? This is simple logic: If those who call upon him in faith are saved, then those who do not are not. Which is why we are commanded to go into all the world and preach the gospel!! Mark 16 tells it plainly, "He that believeth and is baptized shall be saved; but he that believeth not SHALL BE DAMNED." Read that again: He that believeth not is what? Damned. Read it again: He that believeth not is what? _______ . That is not universal salvation. No, not at all. Even John tells us that there are some who don't have eternal life. "ye know that no murderer hath eternal life abiding in him." So why should we believe these men who say that all men do have eternal life? And again, John tells us who DOES have eternal life. "He that hath the Son hath life; and he that hath NOT the Son of God hath not life." "Whosoever shall confess that Jesus is the Son of God, God dwelleth in him, and he in God." This agrees with Paul in Romans 10. The faith which confesses Christ, places us in Christ, AND places Christ in us. Those who are in Christ, ALL of them, will live. But what of those who remain 'in Adam'? They will die. Those who remain in Adam WILL die. But, unfortunately, these unbelievers are counted "enemies of the cross of Christ" (Phil 3:18) "whose end is destruction" (Phil 3:19). Their end is not peace. Their end is not heaven. Their end is not love and joy. When all is said and done, their end is destruction. Doesn't sound like universal salvation does it? No, it doesn't. Paul says that these "shall be punished with everlasting destruction from the presence of the Lord, and from the glory of his power" (2 Thess 1). Yes, Paul does talk about hell. Do you know what "everlasting destruction" is? Destruction is a one time event. It's done, and it's over. But not this. It's eternal. It's for ever. And, yes, it's downright frightening. For THREE YEARS, Paul said. Why? 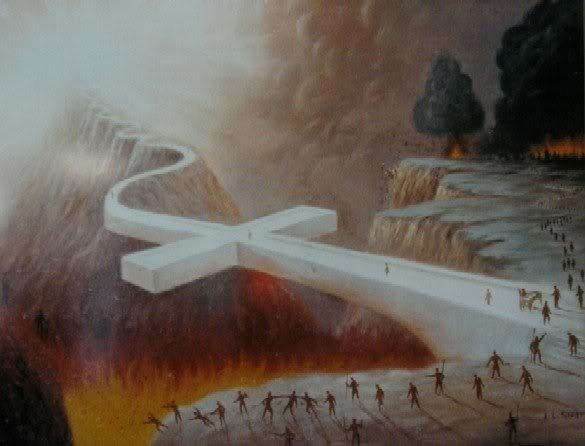 Because hell is real, but universalism is not! We all love John 3:16, but what about John 3:36? "He that believeth on the Son hath everlasting life: and he that believeth not the Son shall not see life; but the WRATH of God abideth on him. " Just as John 3:16 applies to us today, so does John 3:36. "Nay but, O man, who art thou that repliest against God? Shall the thing formed say to him that formed it, Why hast thou made me thus? Enough of this replying against God. It's disrespectful to a holy God.